Belief is not disembodied representation of the world. Rather it is dependent on desire and meaning, and can be seen as neural connections strong enough to form the basis of action. Beliefs associated with opposed desires can be absolutized into conflict, but these conflicts can also be defused by re-framing our assumptions. This is not a matter of ‘rationality’ (which tends to assume a single cognitive model), but rather a wider awareness that allows us to understand the limitations of each belief. This book explores both the dogmatic sources of absolutized assumptions creating conflict, and the ways in which provisionality can integrate conflicting beliefs, at both individual and socio-political levels. This first section is concerned with exploring the meaning of ‘belief’. I want to develop an account of belief that is both formed from experience and remains open to experience without being appropriated by metaphysical assumptions. This means that we need to let go of widespread ideas about belief as an affirmation or acceptance of a representation that gains its significance from whether it matches reality. Instead, I will put forward a view of belief that is built on the implicit and the relationship of desire to action. This view of belief will also need to give full weight to the emotive aspects associated with belief – faith, trust, confidence, and doubt, and the relationship between belief and group ideology. This account will provide the basis of the distinction that follows from it and is the main subject of the book – the distinction between provisional and metaphysical belief. This section explores from different angles what provisionality (i.e. belief held in states of mind that enable it to be integrated) consists in, and how it can be recognised. Provisionality incorporates recognition of complexity and unpredictability. It offers alternative options to the currently accepted belief and its mere negation. It is antifragile (to adopt Taleb’s term) because it increases strength in relation to a variety of conditions, and thus adaptive in a way that is not merely Darwinian. Optionality allows more synthesis in our thinking, which can be balanced with analysis that strengthens our practical capacities. Provisionality requires ‘slow’ thinking (in Kahneman’s terms) where it is practicable to use it, and a recognition of the limitations of ‘fast’ thinking. It requires the capacity to think incrementally rather than absolutely, and to suppress for practical reasons whilst maintaining awareness of what is suppressed (thus avoiding repression). A dogma is a belief strongly held without justification, but dogmatism is the psychological state of hanging onto that belief. The main purpose of this section will be to survey the different types of cognitive biases identified by empirical psychology, and to explain the role of these biases in maintaining this state of dogmatic belief. This will require a clarification of the relationship between bias, fallacy, absolutisation, and feedback cycles. This is followed by a taxonomy of different types of bias and the ways in which these absolutise different kinds of things: subject, object, values, time, meaning, and boundaries in time and space. This taxonomy, explained in relation to a wide range of biases, is what makes this section much longer and more detailed than most others in the series. Finally, there will be some clarification of the ways that dogmatism interferes with compassion, and the ways that it corresponds to widespread intuitions about evil. This section returns to the more philosophical angle from which dogmatic beliefs have been more commonly understood. The focus in this section is on different ways of thinking about the opposing dualisms of metaphysics so as to provide a basis for integration. In every case, if we allow ourselves to think of metaphysical dualisms as inevitable in any sense, this will provide a rooted obstruction to integrating them. In each case, then, we need to be able to replace metaphysical dualisms with incremental alternatives that more adequately represent our experience. Here I set out to explain in what ways habitual metaphysical dualisms can be incrementalised. The reasoning of philosophers who will question anything except the basic need for metaphysical positions has also resulted in a whole host of pseudo-answers, that may address some experiential concerns but don’t reframe the underlying issues, and thus fail to avoid metaphysical assumptions. These ‘false middle ways’ are also called out in this section. The dualisms considered range from stock issues of philosophy, such as theism v atheism and freewill v determinism, to those implicit in political ideologies, economic doctrines, and artistic strictures. In this section I will be discussing a variety of practices that can help us to integrate beliefs, either by making beliefs more provisional or synthesising beliefs when they are sufficiently provisional. The ones I shall be concentrating on most here are those that work directly with belief at a cognitive level, but I shall take for granted a recognition of the equally important role of practices that work primarily with desire (see II.4) and with meaning (see III.6) and their considerable role in helping to create the conditions for provisionality. The integration of belief is often to some degree promoted in education, but much depends on one’s assumptions about the goal and framing of education. The skills promoted in critical thinking teaching, scientific practice, and wisdom traditions can be very helpful. The practice of autobiography can also have a specifically focused value for integrating beliefs about oneself. Integration of belief, like that of desire and of meaning, is not a simple discontinuous achievement. Rather we may achieve it temporarily and then lose it, and achieve it in an asymmetrical way, in some respects but not others. As with desire and meaning, I will also argue that total integration of belief is not a goal that we should expect to achieve or hold beliefs about having achieved. The temporal element of our integration is particularly relevant to the integration of belief as compared to that of desire or meaning, because the integration of belief over time depends on memory. For that reason I will also be putting the question of integration of belief in a wider context of discussion of memory and identity. The relationship between individual integration of belief and scientific or other theoretical progress in society also needs to be clarified. Given the role of political ideology in producing so much unnecessary and unhelpful conflict in politics, how is it possible for politics to move forward so as to integrate belief? Is it a matter of open critical examination of political perspectives? Of political pragmatism? Of consensus? Of establishing a neutral, ‘scientific’ position in politics? Or of political education? I find some merit, and some drawbacks, in all these approaches to the integration of belief in politics. I do not have any new magically effective approach to political integration beyond all these established approaches. Rather I want to suggest that it is the way we tackle each of them, and the assumptions we make when doing so, that can make the difference between a remote, specialised politics from which the public are alienated and a lively and effective democracy. If more of the psychological conditions for an effective politics were addressed, we would be able to get on in turn with more effectively addressing the key issues of our time. 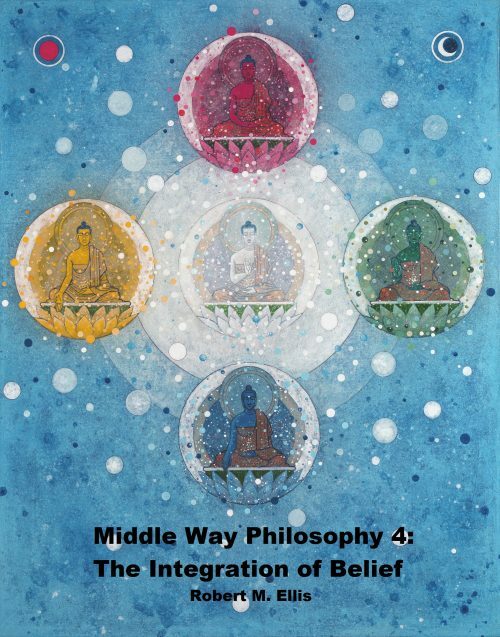 This concluding section for the whole series includes an overview of the entire argument of the four volumes, an account of a reflective meditation practice that may help its experiential absorption, and a brief introduction to the Middle Way Society as a source of social support in following the Middle Way.